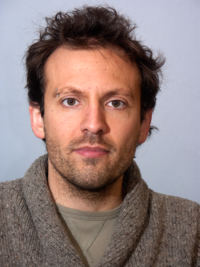 Dr. Pierre Rampal, researcher at NERSC and leader of the sea ice modelling group, has just been granted the prestigious Young Research Talent funding by the Research Council of Norway for the project FRASIL: "FRActal properties of Sea Ice Leads and their impact on the Arctic physical and biological environments". The Arctic has proven very sensitive to increased global temperatures, warming substantially faster than the rest of the globe. This has resulted in thinning and reduction in sea ice cover leading to a new dynamical regime in which sea ice fracturing, which induces opening of leads, and ridging are more frequent. The fractal properties of leads in the ice cover and their extreme variability strongly influence the atmosphere-ocean interactions and the dynamics of the Arctic marine ecosystems. These interactions and their influence on climate are actively debated, although the supporting model premises are presently weak. The project FRASIL will enable a new perspective on the changes endured by the Arctic and their consequences for marine life. In this project, NERSC researchers will assess the role of sea ice dynamics on the upper part of the Arctic Ocean energy budget and on primary production using for the first time a Lagrangian sea ice model, neXtSIM, coupled to an ocean-marine ecosystem model. The neXtSIM model is currently being developed at the Nansen Center, and is unique among sea ice models owing to its rheological framework that is based on solid mechanics and allowing to reproduce the multifractal scaling invariance of sea ice deformation with an unprecedented realism. 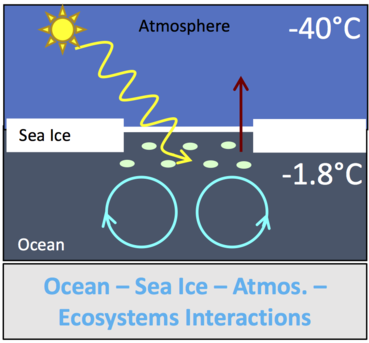 Leads opening in the ice will change the fluxes of heat and light penetration through the sea surface and the lower trophic levels of the marine ecosystem. Sea ice deformations also impact melting and freezing in leads, ridging and sea ice circulation, which are key players in determining sea ice mass balance and age, and freshwater mass distribution in the Arctic Ocean. Advancing the knowledge on the effects of sea ice deformations on upper ocean stratification and ecosystem will have profound implications on our ability to forecast ongoing changes in Arctic Ocean. The new coupled system will represent a major contribution towards giving the Norwegian research community a leading role in studying the Arctic climate system. Sylvain Bouillon, Satoshi Kimura, Knut Lisæter, Einar Ólason, Annette Samuelsen and Timothee Williams, all researchers at NERSC, have also contributed to the project proposal preparation and will be involved in the project. The project will start in 2017 and will run for 3 years. FRASIL was one of 14 Young Research Talent projects selected among the 135 applications submitted under this FRINATEK call in 2016.